Have you seen the new series on the Hallmark Channel? It's called "Signed, Sealed, Delivered." I've been watching a preview that I was given access to on order to write this post. While it has been created and produced by Martha Williamson ("Touched by an Angel" producer), it has a different feel overall, while retaining the wholesome qualities and faith builders that we have come to associate with her. I'm really excited to learn more about the series and to see more episodes. The series has some scriptures incorporated into the themes and the characters even share some verses in their conversations. To help us viewing the show dig deeper into the themes, the American Bible Society has built a study guide to go with the series. If you would like to receive the study guide, you can sign up here by giving your email and they will send it to you. It's a daily devotion and Bible Study. 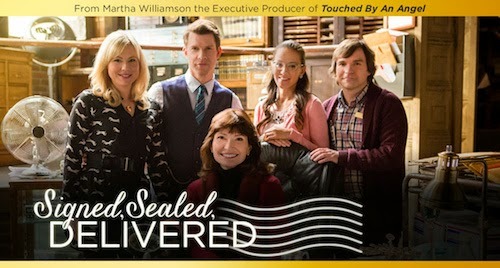 The new original series "Signed, Sealed, Delivered" is a wonderful combination of romance, comedy and drama that follows the lives of four postal detectives who transform themselves into a team of detectives to track down intended recipients of undeliverable mail. Their missions take them out of the office and into an unpredictable world where redirected letters and packages can save lives, solve crimes, reunite old loves and change futures by arriving late but somehow always on time. The team includes charming Oliver O’Toole (Eric Mabius), a genius postal detective and the group’s leader; new team member, Shane McInerney (Kristin Booth), a technophile who brings 21st century sensibility to the group; free-spirited, “girl next door” Rita Haywith (Crystal Lowe) who has a photographic memory; and lovable Norman Dorman (Geoff Gustafson), a master in conventional research methods.The show airs SUNDAYS, 8:00/7:00 CST on Hallmark. Be sure to check out the Signed, Sealed, Delivered Facebook page and like the page. And join me in watching the show. I hope you will comment and let me know what you think! I've enjoyed the preview I got to watch and I'm looking forward to the series. Disclosure: I was given the opportunity to preview an episode of Signed, Sealed, Delivered in exchange for my honest review. No other compensation was given and my full disclosure policy is in effect. Thank you to Flyby Promotions and Signed, Sealed, Delivered for the opportunity to write this review.